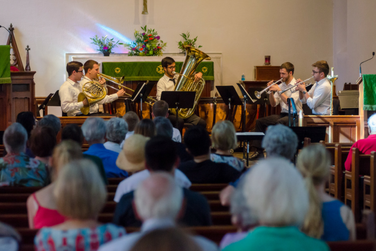 Members of the National Orchestral Institute perform works for brass and woodwind chamber ensembles at St. Andrew’s Episcopal Church in College Park, featuring works by Henri Tomasi, Émile Bernard, and Marcel Dupré with David Houston, organ. A free pot-luck picnic follows. Please note this event was incorrectly printed to begin at 3 PM but has since been corrected to begin at 5 PM. 17 hours 24 min ago.